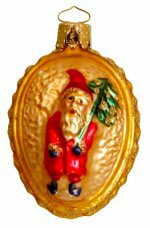 each Christborn ornament truly unique, unmistakable with it's own intrinsic flair. machine would stand in contradiction to our philosophy." 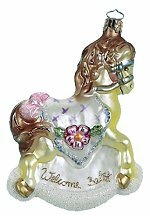 This detailed rocking horse is beautifully painted and glittered by the artisans at the Christborn workshop in Germany, The base reads, "Welcome Baby" on one side and has room to be personalized on the opposite side! 2003 Introduction Made in Germany by Christborn Imported by Tannenbaum Treasures 5-1/2 inches - 14,0 cm Sorry - Currently Out of Stock!